Attempts to show any deer hunting lease habitat in pictures always falls short. Many key details which shows full potential of any hunting lease often are only seen in person. These pictures attempt to highlight those key parts of several deer hunting leases within our Association inventory. That “show best” effort is lacking in this ground picture effort just as aerials help but do not tell the full hunting potential story. 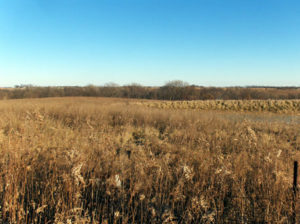 These pictures are also of average deer hunting land. Neither the best or worst we have. 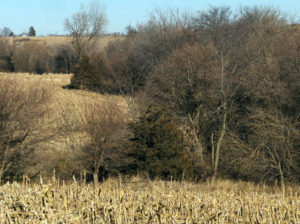 This picture series is from several nearby to each other deer hunting leases scouted before and during season. They represent well how deer hunting buddies will have sufficient land in close proximity that each may hunt different farms and do so from one vehicle. 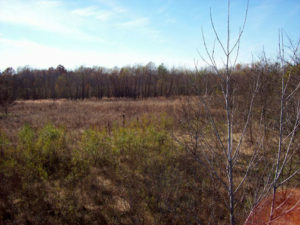 The picture above is of an overgrown pasture. It is from a grain farming operation. It is a small patch of non-plow ground not much larger than shown in the picture. It is however, a spot well out of direct line of sight of any human activity from road, barn yard. It has plenty of low level cover. Hardly a tree to hold a stand. A spot most would choose to hunt from obvious deer sign alone. Lease proximity is made possible by the Association’s collective buying power getting large acreage landowners to lease their land. These landowners seek to have their individual pieces of land within tractor driving distance of one to the other. If the tractor can drive to each easily a deer hunter’s truck can do so faster. This brings the next point of proximity of land is not a challenge for a friendship group of deer hunters to hunt together. It does arise that friends/hunters will not agree on where to hunt. Each is likely to want to hunt different spots. In general terms two hunters may effectively hunt from one vehicle even if hunting different spots. With three hunters in a group satisfaction comes if two are hunting from the same vehicle stopping point, the third from another. Four hunters and above are well recommended to have two vehicles. The second can be a local rental that can be disposed of once one in the party tags out. Four hunters will never agree even on two spots of where to hunt. Just the way it is. 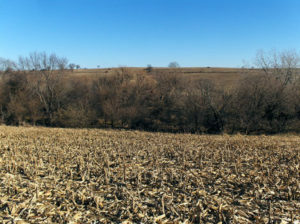 Pictured below is a fallow field within a large creek watershed covering three counties. This picture was taken during early archery season overlapping with early youth gun deer season. Thick trees to the rear of the camera would show nothing but tree trunks. 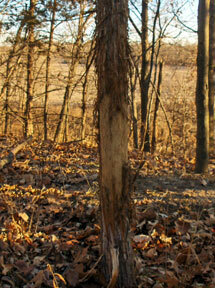 The buck sign was along the edge of the field offering a series of rubs and scrapes. None of this farm is visible from the road. The nearest homestead was long ago abandoned. That point about hunting edges, not heavier wooded interior is well accepted by most. Interior woodlots will have deer move through. At seemingly randomness that frequently fails to comply with 40 yard range. Edges however is where deer preferred browse food source meets grain field food source with easily traveled ground. A concentration effect for where to put a stand. It is often this one stand characteristic which distinguishes a seasoned agricultural land deer hunter from those who hunt big woods. 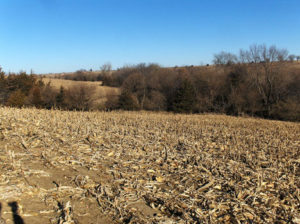 A panoramic picture from high ground within the 50 – 55% agricultural land use region. Or, terrain type offering more trophy whitetail deer potential. Large grain crops in small valleys with wooded/scrub covered hills, drainage’s. Below. A view of another near by lease this time taken from the road. A thick tree covered drainage. Mixed food/cover spot. These pictures just happened to be where Mid-America Hunting Association owner, Jon Nee, took his youngest son for youth rifle season. That hunt did not put any deer of any description in their truck. It was good hunting in terms of land, deer seen and time together. Central midwest includes great plains where agriculture is king. Half of all land surface is in farming. That fact seems lost on many who fail to realize why Kansas, Iowa and Missouri have trophy deer. It is food, mild winters and much rural land. Why we say that point is lost is due to frequent first time central mid-west deer hunter who says our hunting land is no good as there are not any trees. In our region 50 acres of trees spread along a drainage is a large wood lot. For deer hunting our most common hunting habitat is a wooded creek bottom of dry, intermittent or wet creeks or drainage’s. Water driven cover cutting right through grain fields. This picture is looking down a field edge of one dry creek bottom of mature, for the central midwest, deer holding trees. The thinner tree lined drainage running to the left is representative of 8 to 10 such small drainage’s leading into this larger one which runs for a 1/2 mile on this lease. One of two such drainage on 320 acres (half section) well suited for one hunter. An active farm part of a larger corporation lease we were able to acquire due to our collective purchasing power. This lease consists of over 17,000 acres owned by a multi person corporation farm that has no door to knock on. An average deer hunter group would be hard pressed to be able to afford this land. The corporation also did not allow individuals to hunt it out of liability concerns. The Association being a business entity trumped the individual liability protecting the corporation and made the deal possible. The end result is land that went unhunted before is now available to the average deer hunter. Even though this spot is dedicated by map identification to one hunter it will easily support two. For two hunting buddies that wanted to hunt from one truck on the same spot this one would work. The two wooded creek lines are separated out of direct line of sight one from the other. Each creek line would allow for more than a couple of stands that could not be in line of sight from the other. If putting all the pictures in this series together of this near to each other deer hunting leases then perhaps 1/10 of this lease may be visible to the reviewer. Looking over the fallow pasture to the tree line of a tree covered dry drainage. The weed area was readily used as bedding. Sometimes when reviewing any land for its deer hunting potential the weight of habitat quality, location and physical sign is all we have to go on. While we would all rather have eyes on a trophy quality racks to make any decision easier, that is not a reasonable expectation. 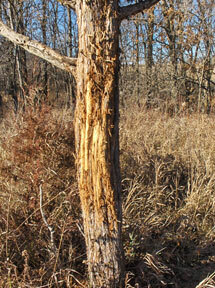 It takes some hunting performance over several years to know the true value of any spot. What we offer is self guided hunting. It is tough. While we would all like to be career long trophy hunters with a wall or more full of trophy racks it is not reasonable to except that desire. With us what is reasonable to expect is to hunt within a quality whitetail region where expectation of finding relatively un-pressured whitetail may be expected every day.